Wellness for the World: Fruit is Not Good for Me? This is a tricky question that honestly, I am not afraid to ask. I see more and more clients use fruit as a constant quick fix, push detoxification too quickly and create challenges for their liver with something that should be very health for us. I first want to share that quality fruit used properly in your diet is a very positive impact for most. Unfortunately, most do not get quality and consistently over use fruit in their diet. Let's first discuss the "quick fixing" problem that I see all the time. Most of us have a perception that fruit is very good for us, so we tend to use this on a regular basis all year and actually create an overuse. What often happens is we either make poor nutritional choices or even quality nutritional choices that are not right for our Nutritional ID. When this occurs, we do not pull the necessary nutrients from our foods which leaves us with an energy deficit. When the body is deficient in energy, there is a strong desire to fill this void. Due to the fact that most if not all if us have had sugar often in our lives, our bodies understand that sugar is a quick fix for energy. Since most are quick fixing often if not regularly, we are often over consuming fruit, challenging blood sugar, increasing insulin, leading to gout, raising triglycerides and storing body fat...all with something "good" for us. Yes, that something is often fruit. It is easy to understand why we would do this if we are eating like garbage, but what if you are eating very well by conventional standards? This is often due to the fact that we are not eating according to our bio-chemical individuality. This leads to a poor food to energy ration and ultimately the need to "quick fix." Before I go on I want to mention, if you do not know your Nutritional ID, follow this link for your complementary assessment. How can fruit challenge the liver? Fruit will contain high amounts of sugar varied by the fruit as well as how ripe the fruit actually is. This fruit sugar is called fructose. Since fructose gets shuttled to your liver, and if you consume high amounts of it, fructose ends up taxing and damaging your liver in the same way alcohol and other toxins do. In fact, fructose is virtually identical to alcohol with regards to the metabolic havoc it wreaks. Let me be clear that this is for those the over consume fruit. If you are like most that snack on fruit all day, that would be you. While most that think about gout focus on purine levels of proteins consumed, I would suggest that the larger problem is actually fructose. The link between fructose and uric acid is so strong that you can actually use your uric acid levels as a marker for fructose toxicity. I would recommend everyone to have their uric acid level checked to find out how sensitive you are to fructose. As you know, two-thirds of the US population is overweight, and most of these people likely have uric acid levels well above 5.5. Many are even be closer to 10 or above. Measuring your uric acid levels is a very practical way to determine just how strict you need to be when it comes to your fructose consumption. As an example, if you're passionate about fruit and typically eat large amounts of it, but find out you have a uric acid level above 5 (or better yet, 4 if you're a man, and 3.5 if you're a woman), then you may want to consider lowering your fruit consumption until you've optimized your uric acid levels, to avoid harming your body. You can refer to a recent blood chemistry profile to review your uric acid levels or thankfully you can test your uric acid levels at Walk In Labs for only $19.00 from virtually anywhere in the country. How does fruit consumption push detoxification? It is important to recognize that raw foods are used for cleansing and detoxification. Often when fruit is in high consumption and uric acids are up, this is pushing too great of a detoxification process. I will share that I am always careful with my clients to maintain a healthy and comfortable process and balance of detoxification and nourishment. Since most eat fruit raw and often over consume fruit, this can create too high of a detoxification to nourishment ratio. So how much fruit sugar is actually in the fruit you consume? Notice that the figures below are based on a one cup serving. The other factor to address is quality. If you have any comments or questions, please leave them below and I will address this personally. Yes, I agree that fruit does have negative health impact for some. But what the example above lacks (witht he comparison to straight sugar packs) is that fruit also contains fiber. Sugar packets do not. Yes, you are absolutely correct. 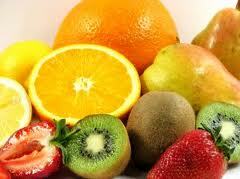 The fiber in the fruit does slow the release of glucose and it is also helpful to consume fruit with fat. This will further slow the release of glucose. With that said, we can let everyone know that one of the worst ways to consume fruit is in a juice form. I have a visual idea of a "packet of sugar", but I do not know how many grams of sugar are in a "packet of sugar". can you please add that information? We have no sugar (or sugar packets) at home, but I teach nutrition to kids and would like to use your examples to do some sugar math with them. The most recognized brand of sugar packets contains 4 grams of sugar in one packet.